Recently, my days have been busy with children’s book design, which I LOVE to do, but I am also very happy to share with you a series of NEW children’s art that I painted. 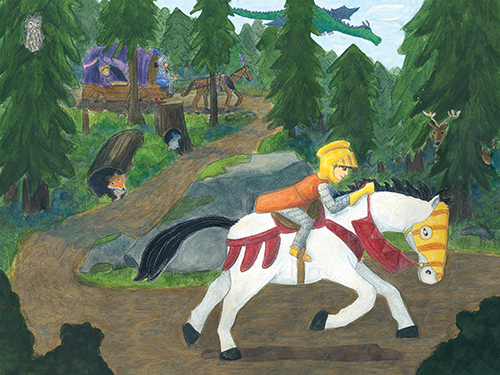 I was asked to create a series of knight themed paintings featuring a trio of kids, as knights and a princess. My first thought was there has to be a big dragon! 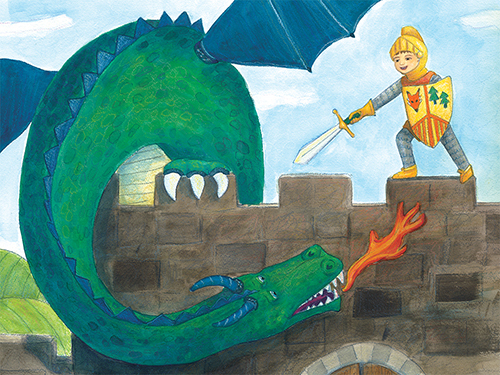 As I sketched, the dragon became a key element in all three paintings. I also kept the knight and dragon fight a little ambiguous whether this is a battle between foes or if this is more of a play battle between friends. The viewer gets to create the story. The golden knight riding his white horse leads the way for the princess and her blue knight. I also wanted this scene to become a “Do you see…” game between parents and kids or between kids themselves, so I placed additional forest animals in the background. The three paintings tie together enough so viewers young and old can fill in the details and complete the story. In which painting would you start the story? I’d love to hear it! All three paintings are now available at the 8″ x 10″ size in our Etsy Store. If you want any of the images in the larger 11″ x14″ (matted to fit 16″ x20″) please email me. I will also have these knight prints available at my next art show, which is the RIT Craft Show on Friday March 23rd. This event is held in the SAU from 10 am -4 pm. Come see the new art!